This all started when I found a bag of Meyer lemons hanging on my front door. I suppose I’m getting a bit of a reputation, huh? I knew it had to be my friend (and across-the-street neighbor) Marcie, because who else would do such a thoughtful thing so anonymously? I wanted to make something worthy of such a nice gift, so I combed the web. For days. I found a recipe on Better Homes & Gardens, and started to play, and what emerged was magnificent. A soft crumb. Strong lemon flavor with sweetness attached to take away the edge but keep things flavorful. 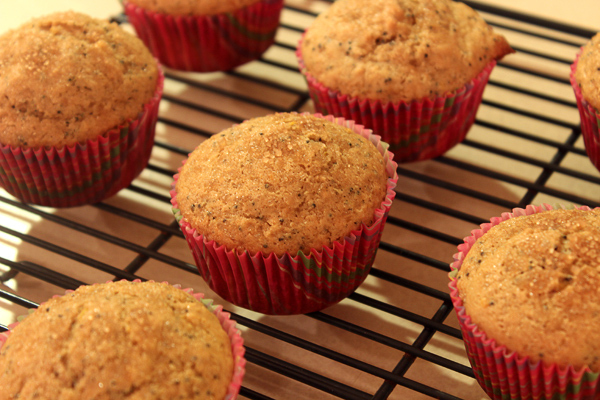 A crunch from the poppy seeds, a crackle of turbinado sugar on top. 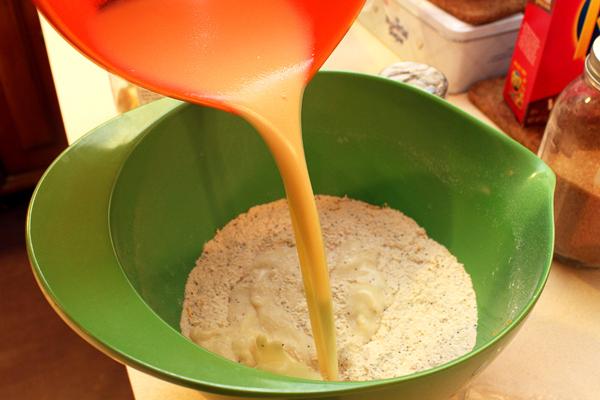 And healthy ingredients like wheat germ, yogurt, and enough canola oil to be good for you without weighing you down. I win! 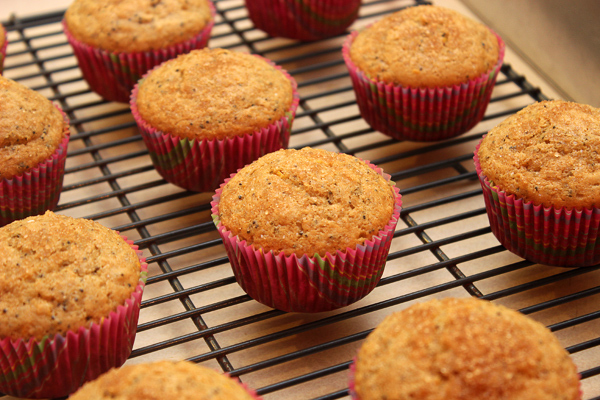 And so does everybody else who get to eat one of these irresistible muffins. I started by zesting those beautiful Meyer lemons. The zest went right in with the dry ingredients: whole wheat white flour, wheat germ, baking powder, baking soda, sea salt, and sugar. 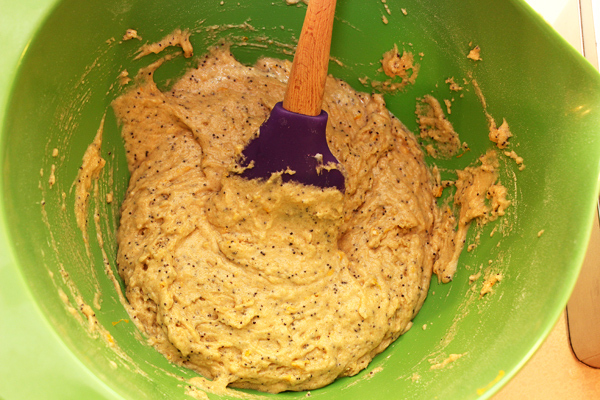 And poppy seeds! Liquid ingredients next. Milk. Egg. Oil. Yogurt. Vanilla bean paste. And of course, some Meyer lemon juice, freshly squeezed from a zested lemon. 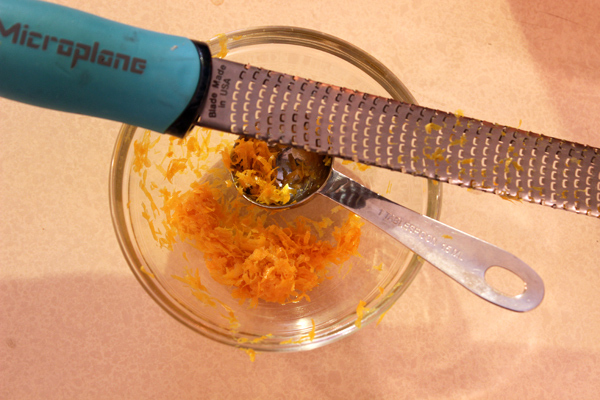 I’ve played with this recipe several times, and I think 6-7 teaspoons is just right. Next step, obvious: pour the liquid ingredients into the dry. 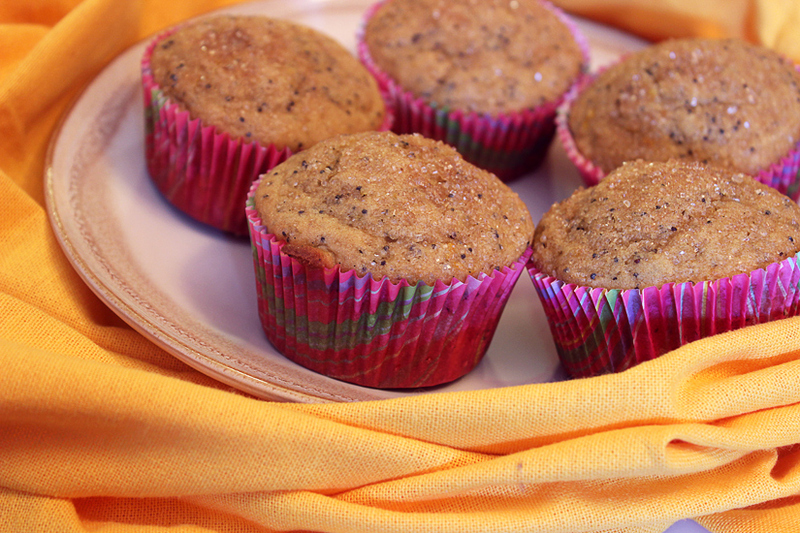 Meyer lemon poppy seed muffins, baked to perfection. Look at them. Then close your eyes and smell them. 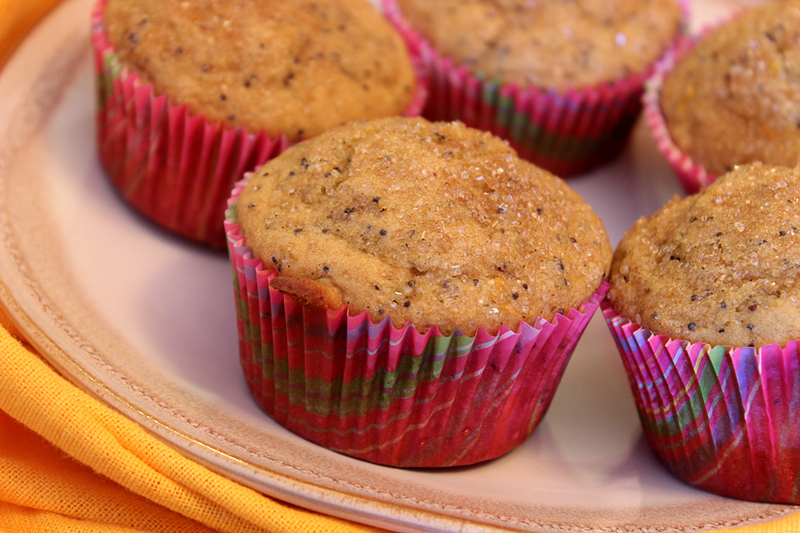 Everything I have been looking for in a citrus-infused poppy seed muffin is inside them. 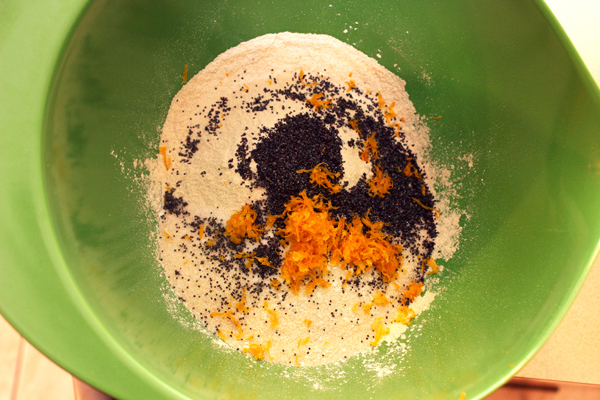 In a large bowl, whisk together the flour, wheat germ, sugar, poppy seeds, lemon zest, baking powder, baking soda, and sea salt. Make a well in the center and set aside. 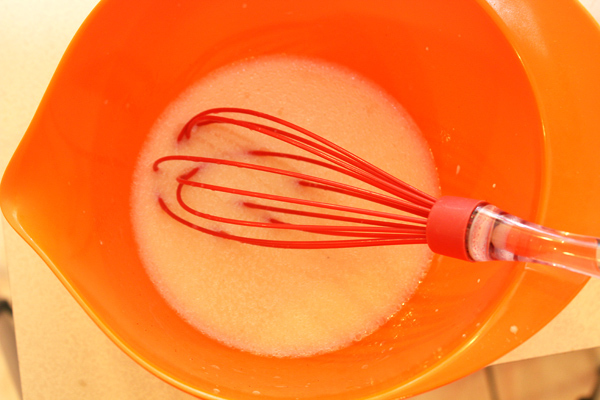 In a medium bowl, stir together the milk, oil, yogurt, egg, lemon juice, and vanilla until thoroughly mixed. 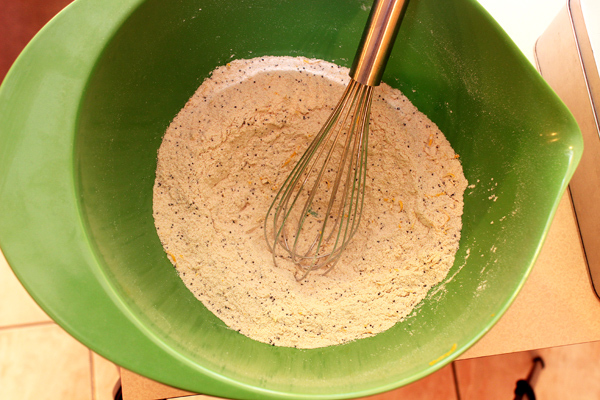 Pour the liquid ingredients into the well in the flour mixture and stir just until combined, but not any longer. Scoop batter into muffin tins, dividing as evenly as possible. (An ice cream scoop works beautifully.) Sprinkle each one lightly with turbinado sugar. Give them another five minutes in the tin, then remove to a wire rack.